I originally come from the central region. I love, above everything else, tourism and travelling. I like human relations and now I work, at age 50, as an artisan taxi driver. My aim: helping the sick people, those in difficulty, to overcome severe and challenging diseases. I have been through it, having endured among my relatives, without mentioning the cancer tests! I do my best to help those I carry to their medical care centres. In addition, without any doubt, you will easily understand that is beneficial to escape from time to time to tourist areas. I like, among others, Mont Blanc where we now have the joy of being the owners, but also, Corsica, which I particularly like. However, in my younger years, I was not focused on this type of professionalism and worked as a 'secretary accountant". When my husband was young, he dreamed of this area he particularly loves. I had the dream of having a ground-level house. Our parents helped us to achieve it! Therefore, in their memory, we only had one idea, improving it year by year, and to make the rent, allowing our tenants to live happy days of holidays in a warm atmosphere. As a result, the chalet provides an opportunity for our children, now our six grandchildren, to come to them throughout their lives, to learn snow sports, and to enjoy the air of this wonderful country, Pays Du Mont-Blanc, our second home where we feel good! See you soon! View of Mont Blanc and its mountain range. Household appliances. Classified by the ministry of tourism in 2011. Calm, tranquillity, independence, green space in summer, personalized by a receptionist at your disposal for helping you with any problems you might encounter. Bed made on arrival with ornaments of disposable beds. Maintenance complete chalet after departure by thereceptionist - It can accommodate up to 21 people + a baby. Landline phone at your disposal- wireless model phone. Winter sports rentals 2016: opening- rental served by the Facilibus TAD of Saint-Gervais. 300 minutes away on foot, there is a regular shuttle service at the crossroad of Saint-Nicolas-de-Véroce route. 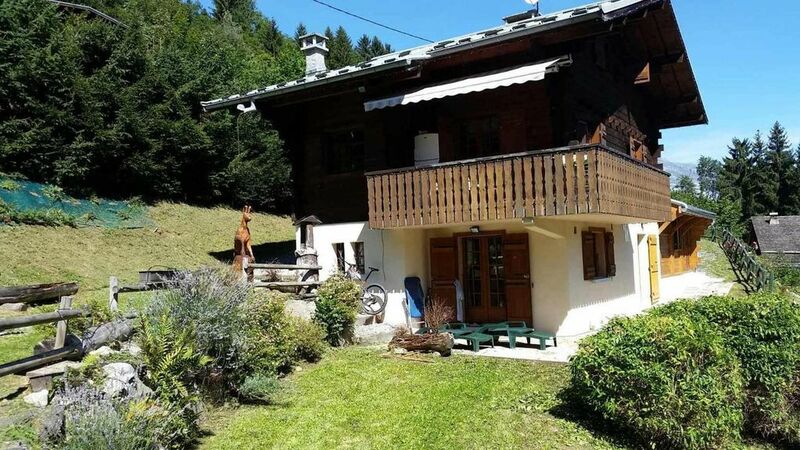 It is close to Saint-Gervais-les-Bains (3 km away), Megève (7 km away), the lake (5 km away), the shops (3 km away), and the city centre (3 km away). The chalet is in front of Mont Blanc with all the windows facing the mountain range, except for the bedroom with bunk beds overlooking the roadside. There are many transport services available to La Cure as well as the ski resort with the Facilibus TAD (Transport on Demand by phone call the day before). It is 3 km away from the ski resort, passing behind the chalet. Less than 10 minutes away, driving carefully, you will find large free parking spaces, and you will be at the foot of the chair lifts available In summer, you will find a riding school, tennis courts, children's games, and mountain biking rentals to visit the mountain. Starting from the chalet, professional guides are offered to climb Mont Blanc (requested a week before to organise a high-altitude course before) 5 km away from the chalet. In summer, hiking climbing, average climbing, and high-mountain climbing are available. There are golf courses in Megève and Chamonix (Visit the cities’ websites). Ski: Visit the Bettex ski resort in Saint-Gervais-les-Bains, perfectly snow-covered in spring.